So you’re thinking of going to India ? Help make it a firmer idea by setting the mood and prepare your mind – it will help consolidate your thoughts and make it a firm decision. How do you set the mood and prepare your mind for India ? Ever since I was in my early teens I had an unconscious love of India – all those Joss sticks I used to burn and the hippy fashion I followed. Later I had sari’s as curtains in a deep pink bedroom. India was top of my bucket list. You’re not going to be in India very long before the heady aroma of incense arouses your senses. There are a huge array of incense sticks in the shops and online. 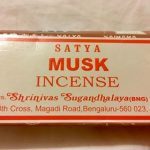 Currently one of my favourites is Satya Musk – but I have a huge variety of incense sticks at home – I burn at least one a day. Satya is an Indian brand – well kind of two brands actually as it was one company inherited by two brothers who couldn’t agree on how to run the business so they split into two companies. One is based in Mumbai and the other in Bengaluru. Some flavours are the same name but smell differently depending on which location you buy from. Mumbai’s are machine rolled while Bengaluru’s are still hand rolled. I like both generally but it is personal preference. The most famous scent is Nag Champa – apparently its what is burned in Amsterdam coffee shops – though I’ve never been to Amsterdam. If you do nothing else to prepare your mind for a trip to India – do this one. They are cheap and the aroma will linger in your home for days. Follow the link to Amazon to find my favourites and many many other scents. This is the true story of a man adopted in Australia looking for his real mum in Kolkata who he was separated from when he was five years old. Not only a good film but great scenes of Kolkata if you’re thinking of travelling there. Five times nominated for Bafta. Starring Dev Patel and Nicole Kidman you know it’s going to be a good watch. Dev Patel, Judi Dench and a host of other well known actors make this a great watch for the amusing idiosyncrasies you may encounter in India – a good light hearted enjoyable film set in Jaipur. No I havn’t been there yet ! Another Dev Patel film – actually the one that made him famous – is there anyone that hasn’t seen it ? Still worth another watch and concentrate on the background as it is set in Mumbai. When you fly into Mumbai you will fly over the slums as they are located right outside the airport parameter. From guide books to fiction there are a huge array of books that will give you the facts and flavour of India. I suggest you read as many as you can. These are my favourites. This book is top of the list for non-fiction and I don’t know many people who havn’t referred to this book before they travelled. It’s quite a hefty book 1200+ pages long. Mine has an array of coloured page markers though it. I found it indispensable – and if you only read one book before travelling then this one is the essential one. I consulted it before every trip. It’s divided into areas so you don’t have to read the whole book but I advise you read thoroughly the section that covers where you are thinking of heading. It gives info on many places to stay in each area according to your budget. Even disregarding the Indian connection this is my favourite book I’ve EVER read and I know I’m not alone in thinking this. Everyone I know that has read it has exactly the same opinion. It’s just a truly awsome read. It’s a semi-autobiographical story of an escaped heroin addict prison escapee who lands in Mumbai on a fake passport and ends up living in the slums. Just read it ! I read it before I went to India and again afterwards with fresh eyes. I promise you won’t be disappointed if you do the same. It’s just so good I read it every few years. You’ll encounter gods a plenty in India , probably starting in your taxi above the dashboard from the airport. Or even the bus and in every cafe. Ganesh, an Indian god, banishes obstacles – let him help you banish any obstacles preventing you from travelling to India by hanging this beautiful wall hanging in your personal space – I have a Ganesh above my bed. Wear it to remind yourself daily to save for your trip.